There are currently two articles on the subject of the Special Tribunal for Lebanon, which opened proceedings last week, on the Middle East page of the BBC News website. 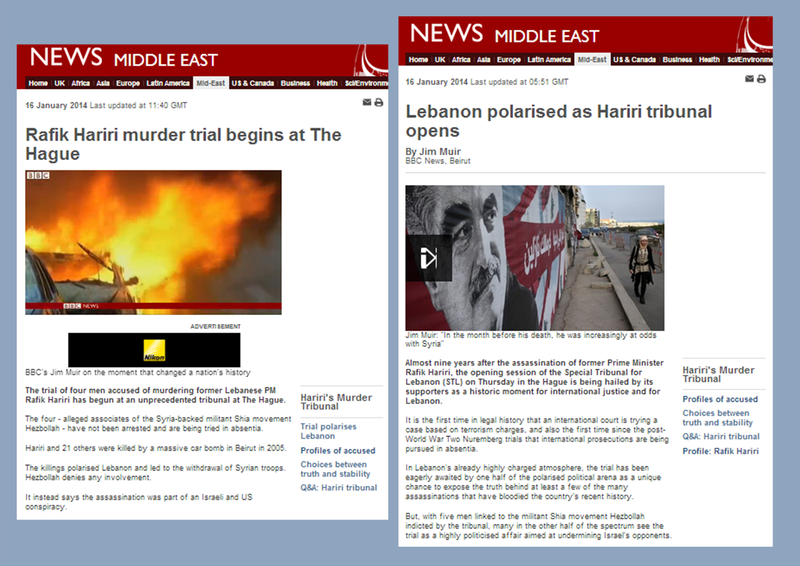 In the ‘Features & Analysis’ section appears an article by the BBC’s Beirut correspondent Jim Muir titled “Lebanon polarised as Hariri tribunal opens” which also includes a filmed report by Muir broadcast on BBC television news programmes. That filmed report is also included in an article titled “Rafik Hariri murder trial begins at The Hague” which appears in the news section of the website’s Middle East page. In all three of those items, Hizballah propaganda is uncritically promoted in among the rest of the information provided. “Hariri and 21 others were killed by a massive car bomb in Beirut in 2005. The killings polarised Lebanon and led to the withdrawal of Syrian troops. Hezbollah denies any involvement. “The Hezbollah leader, Hassan Nasrallah, set out his movement’s narrative on the affair in August 2010. Introducing video footage he said was intercepted from Israeli spy drones, he argued that Israel was behind the killing, tracking Rafik Hariri’s movements, and penetrating and manipulating Lebanese phone network records on which the bulk of the prosecution case is apparently based. The Special Tribunal for Lebanon was of course established by the UN Security Council. “The BBC clearly has a problem knowing how to relate to the streams of all too predictable propaganda regularly produced by regimes and terrorist organisations in the Middle East. Its current practice of uncritical repetition and amplification of baseless rumour, conspiracy theories and propaganda is clearly incompatible with its obligation to “build a global understanding of international issues” and its self-declared aspiration to “remain the standard-setter for international journalism”.